Attributes define the properties or internal data elements of an element. Not all element types support attributes, and others have restrictions; for example, attributes of Interfaces must have Public scope. In the Project Browser, elements with attributes (typically Classes) have their attributes listed under the element name, each preceded by a blue box ( ). 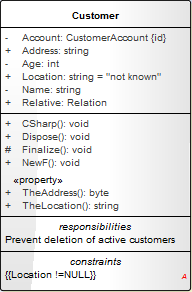 When depicted in diagrams, the attributes are listed in the first properties compartment of the element, as shown in this Customer Class example. Attributes themselves have several important characteristics, such as type, scope (visibility), derivation and notes. On the 'Attributes' page of the '<element name> Features' dialog, you create and modify attributes using the various panels and tabs. You can copy or move existing attributes between elements, if the target element also supports attributes. You can create property implementations specific to your coding languages for each attribute. The attributes of an element can be inherited from one or more successive parent elements in the model. On a diagram, you can show which attributes are inherited from which 'owning' element in the hierarchy.